Want Gigabit Internet? You Don’t Have to Move to Kansas City. Who among us didn’t wish just a little bit that they lived in Kansas City this week? I mean, come on, who doesn’t want the kind of Internet connection speeds that Google Fiber is offering? A whole gigabit down and up? That’s not just kid-in-a-candy store speed, that’s kid-in-a-candy-warehouse speed. The TV offerings I could take or leave, though certainly in time they’ll improve. Right now, I’m paying cable company RCN $80 a month for 75 megabits down and 10 up, its fastest Internet package, and Speedtest.net tells me it’s struggling to meet that: The tests I’ve run this weekend are topping out at 69 megabits down and just under 10 up. And I’m paying $10 a month more than Google will charge (not counting the upfront $300 construction fee). And even if I wanted my own fiber line from, say, Verizon FiOS, I have two problems. First, it’s not offered in my apartment building. I don’t know how these things work, but for some reason my building is RCN-only. I can’t even get service from New York’s dominant cable service provider, Time Warner. And even if FiOS were an option in this building, the top speed offered in its “Ultimate” package is 300 megabits down and 65 up for $210 a month. Nowhere near a gigabit in either direction, and it costs $140 a month more than Google Fiber will. And, yes, I know it’s barely getting started. Google has yet to select the first neighborhoods where it will offer service, and it’s unleashing a competition in which different areas of Kansas City on both sides of the Kansas-Missouri line will drum up market demand. But still: If Google can offer this level of speed, it makes you wonder why others haven’t. Well, it turns out others have. If you want gigabit Internet speeds from your own fiber optic line, like the one that Google is offering in Kansas City, you can move to another community that also happens to straddle a state line. 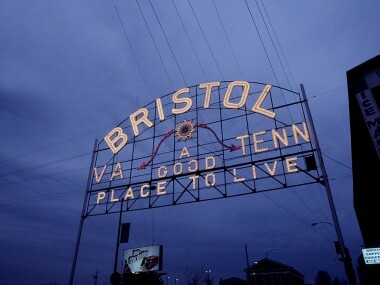 It’s called Bristol, and it is situated on the Virginia-Tennessee border. On the Virginia side of the border, the local power company, Bristol Virginia Utilities, started building a fiber network for its own operations in 1999 after a nasty storm knocked out its operations. The plan was to connect eight substations with a fiber optic ring. When it turned out that adding capacity was cheap and easy, it was a no-brainer to add local government buildings and schools to the network. Bristol area schools have had access to gigabit speeds since 2000, when most schools were happy to have 1.5 megabits. The next step involved offering Internet, TV and phone services to consumers directly, but it ran up against a state law that had the effect of protecting incumbent carriers — basically Charter and Sprint. BVU took the state to court and won in 2001, arguing that the 1996 Federal Telecommunications Act gave it standing to offer telecom services. It then won approval from state lawmakers to get into the business. After a handful of other legal challenges, it began offering residential triple-play service in 2003. It added residential gigabit service this year, though at $320 a month it’s a lot more expensive than what Google says it will offer in Kansas City. The network has also encouraged a lot of economic development. Defense contractor Northrop Grumman brought 700 jobs to town basically because the fiber network was available. DirecTV brought 100 more. Eight hundred jobs amounts to serious economic gains in an area with a combined population of 43,000 on both sides of the state line. Today, the network, called OptiNet, has about 12,000 residential subscribers, which amounts to a take rate of about 70 percent within it physical footprint. And while the story of Bristol’s network is a great one, it’s not the only one like it. Lots of other communities have found ways to build their own super-fast fiber networks. Chattanooga, Tenn., and Lafayette, La., are two others you can read about in this report by the Institute for Local Self-Reliance. You can get a gigabit in Chattanooga for $350 a month, and in Lafayette for $1,000 a month — which sounds like a lot, until you realize that until recently in that market it cost $20,000 a month for that kind of bandwidth. The first customer was a local school. There’s a patchwork of many other examples where gigabit Internet is available either from quasi-public or outright public sources, the notion of which tends to make established carriers and their lobbyists and lawyers irritable. Some private carriers have gotten the job done, as well. Sonic.net is already known for its $70-a-month service in a small area of Sonoma County, Calif. There’s a service coming to Maine. Gigabit service is an option in this small town in Minnesota. And there are lots of other communities with fast fiber service at various speeds on this map. Chances are you don’t live in any of them. But now that Google has thrown down the gauntlet in Kansas City, perhaps the established broadband carriers will in time be forced to respond.